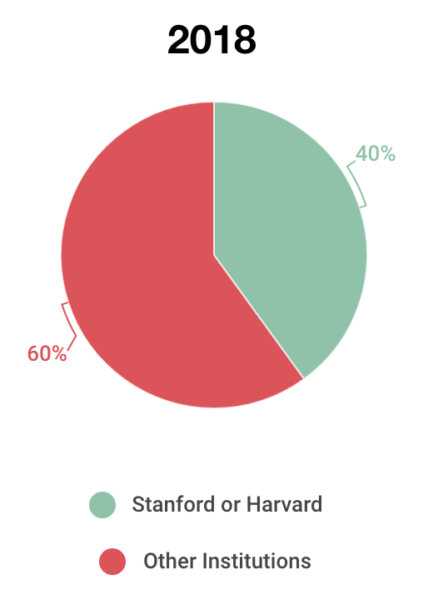 I read this post yesterday that says that 40% of VC investors went to either Stanford or Harvard. I’ve worked in this industry for over thirty years. It is full of Stanford and Harvard grads. I’ve got nothing against either school. They are wonderful education institutions and full of great people. We have Stanford and Harvard alums at USV so we are certainly a contributor to this statistic. But we don’t have 40% of our team from those two schools. We don’t ask where you went to school on our analyst application. We ask you to answer four questions and we go from there. I learned the VC business from a man who went to Case Western Reserve University, my co-founder of Flatiron Partners went to Queens College, and my co-founder of USV went to Wesleyan University. We have hired analysts at USV that did not graduate from college and maybe didn’t even go, I really don’t know and don’t care. The VC business is making some progress on gender diversity. This chart is from the same post that I linked to at the start of this post. Eighteen percent is not a number to be proud of, but 60% growth in two years is. 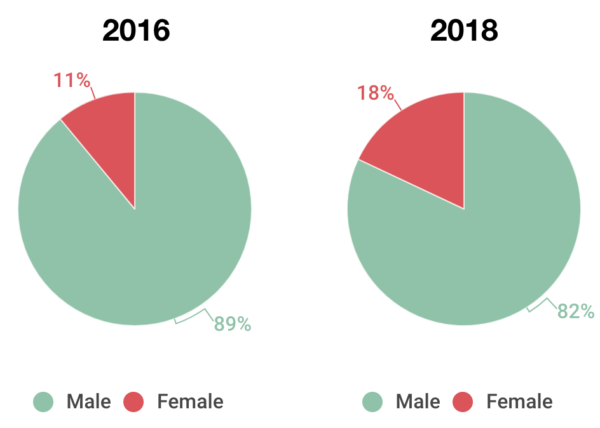 If we continue at that rate of gender diversity growth, the VC business could be gender neutral by the middle of next decade. It would not surprise me if that happens. I feel the desire for gender diversity pulsing through our industry so powerfully right now. But in most other ways, the VC business is still a very homogenous place. Mostly white and, it turns out, mostly educated at a handful of higher education institutions.